“We call upon the UK and Scottish Governments to stop subsidies for electricity from biomass and bioliquids (i.e. agrofuels) which mean more land-grabbing, logging and industrial tree plantations worldwide. “Under the Renewables Obligation, the UK and Scottish Government are offering generous subsidies for burning unlimited amounts of wood, most of it imported, as well as agrofuels for electricity. Although the UK Government has proposed to cap the amount of subsidies for electricity from agrofuels, that cap would still translate into a minimum of 110,000 hectares of new plantations, most likely oil palm plantations in the global South. “The scale of the UK’s biomass plans: The UK Government wishes to see biomass generating up to 50TWh by 2020. This would require over 50 and possibly over 60 million tonnes of wood being burned in UK power stations each year, compared to a total UK wood production of less than 10 million tonnes annually. This figure is likely to escalate, as the bottomless subsidies are likely to attract more investment from companies. By comparison, total EU wood pellet imports were 11 million tonnes last year. “At present, most UK wood imports come from North America, as well as from Scandinavia, the Baltic States and Russia, contributing to more logging and more forest and biodiversity destruction in those regions as well as releasing large amounts of carbon as a result. Companies are increasingly looking to source wood from industrial tree plantations in Southern countries, too, for example from Brazil and Ghana. Both directly and indirectly, the vast new demand for wood require an expansion of industrial tree plantations and thus more land-grabbing, more destruction of forests and grasslands and more depletion and pollution of soils and freshwater. This poses a further threat to the rights and livelihoods of Indigenous Peoples, forest-dependent peoples and small farmers. Biofuels, be it to fuel cars or to fuel power plants, are irrational and immoral! In North America, biofuels largely take the the form of mandatory ethanol content in gasoline. This counter-productive strategy has led to enriching subsidised agribusinesses and ethanol producers, driving up grain prices. Predictably, food prices have risen with dire consequences for the poor of the world. The ethanol business is ruinous for taxpayers, but lucrative to farmers, who have happily jumped on the bandwagon! 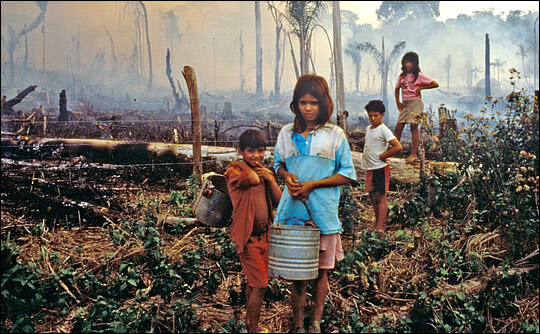 The consequence: we have all heard of rain forests cleared up to make room for biofuel-producing crops of all sorts. There is no doubt that this strategy has led to large-scale deforestation with negative consequences for local human populations and tragic consequences for wildlife.